Remember earlier in the year when we all went into a meltdown to get our hands on a Frozen Oak? 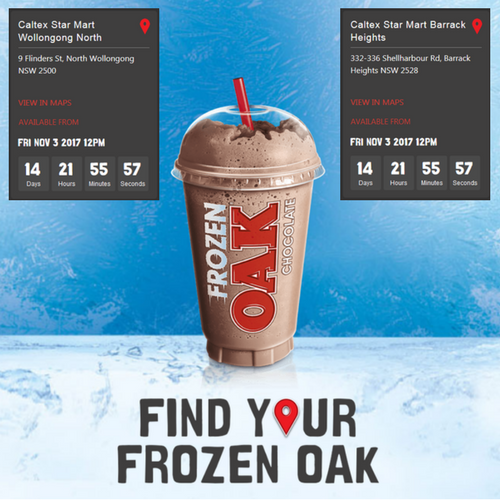 As it turned out, only a few select Caltex locations actually stocked the elusive Frozen Oak machines with the Illawarra being left out. Well, now there's good news for those of us in the Illawarra desperate for a taste of the cold chocolate treat. Oak has just announced 140 Caltex stores nationwide will be stocking Frozen Oak in the coming weeks - and two of these will be in the region. The Caltex Star Marts at North Wollongong and Barrack Heights are the spots to hit - available from Friday November 3.